The Prescription Form is one of the most complex and busiest forms within EasyDose. 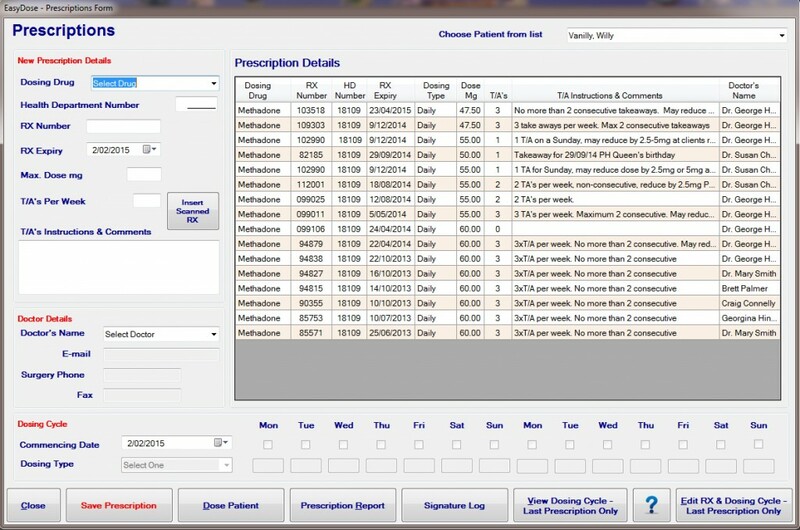 Many functions are performed from this form which includes adding a doctor ‘on the fly,’ viewing last dosing cycles, editing last unused prescriptions, editing the dosing cycle during any period of the prescription life cycle to adding and attaching a scanned prescription against a corresponding record. Navigating to the Prescription Form from either of these options, opens the Prescription Form as depicted below. The only function in this view is to choose a patient from the drop down list. Selecting a patient from the “Choose Patient from List” drop down box. 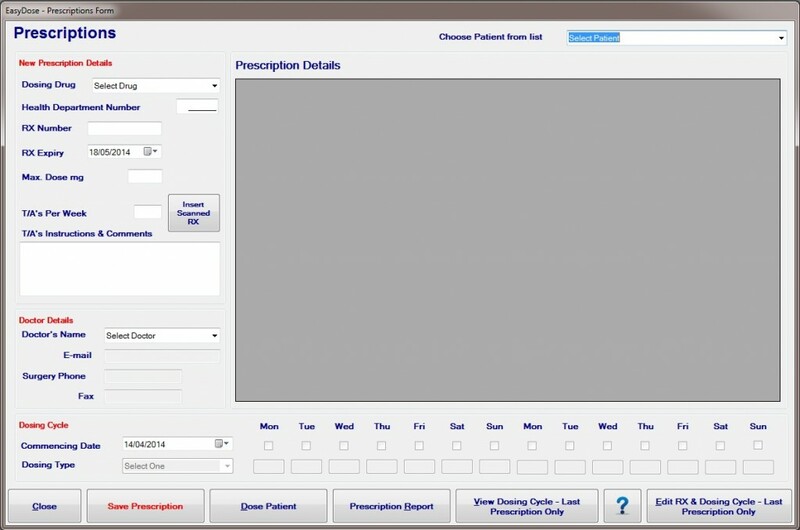 The prescription will open at that patient with blank fields ready to input data for a new prescription. 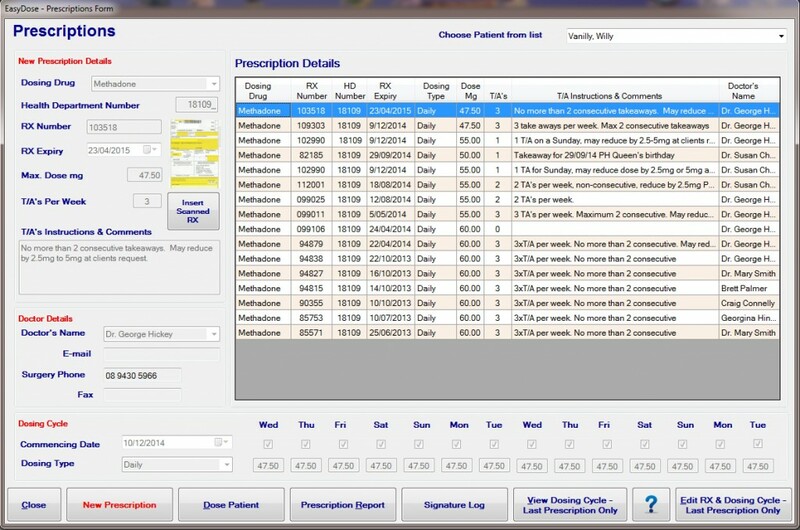 If prior prescriptions exist for that patient, they will be displayed in the grid. Adding a prescription must be manually completed in its entirety. Once all fields are complete, click the Save Prescription button to retain the settings. The prescriptions are displayed in the Prescription Details grid in descending order of entry. All details of the last prescription can be edited providing the patient has NOT been dosed against that prescription. The Edit RX & Dosing Cycle – Last Prescription Only button is used to edit the prescription. If a patient has any dosing history against a prescription, then only the Dosing History, T/A’s Per Week and T/A Instructions & Comments field can be edited. Although the last prescription is read only, except for the dosing cycle, the number of takeaways can be changed to accommodate changes as required. Click on Edit RX & Dosing Cycle for the Last Prescription Only. The last prescription added WAS the active prescription but now the system does recognise a prior prescription which has not expired. By default now, the prescription with the lesser expiry date is the current prescription, but this can be overridden by selecting the check box on the right side of the Prescription Details table. Placing a tick against a prescription, will make it the default prescription.